We have 3 fishy activities including a letter craft, counting and fine motor skills game, and a creative painting art activity. I have to admit, we are fish people. (At one point we had 6 running fish tanks-crazy I know. We have consolidated to 2 now). So with our fishy housemates, and frequent visits to the aquarium it was only natural that we enjoy some F is for Fish activities. Just to let you know, we have done some fun ocean themed activities that would compliment our fish activities perfectly; like Ocean animals printable, Ocean Explore Table, and Ocean waves sensory activity. Find all our Letter of the Week A-Z Series here. 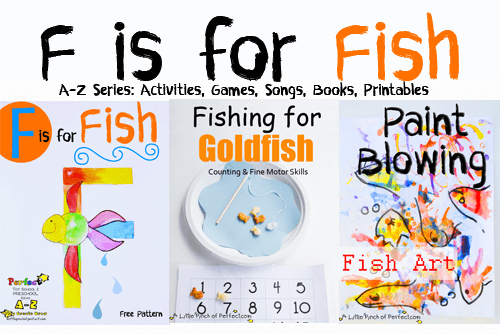 3 fishy activities including a letter craft, counting and fine motor skills game, and a creative painting art activity. This song has been a family favorite for a long time. 1. 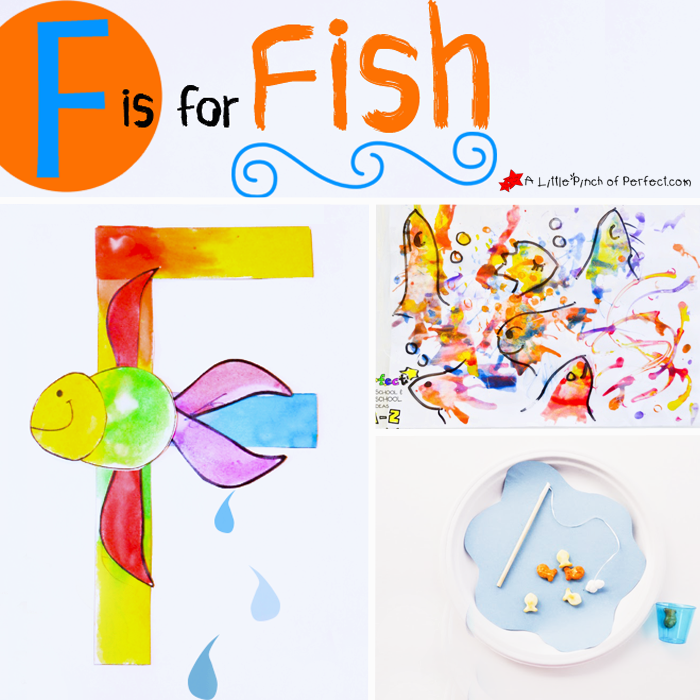 Decorate your letter F parts and fish. 2. Cut the parts out and glue the rectangles together to form the letter F.
3. Glue the fish parts on the letter F.
Catch and count goldfish crackers game. 1. To prepare, tape a piece of floss to the end of your skewer. Remember the longer the floss is, the more difficult it will be to catch a fish. Ours where around 6 inches long. We didn’t need long strings because we fished off of the table instead of the floor. 2. Cut out blue paper in the shape of a pond, and place on the plate to look like water. Tie a marshmallow to the end of the floss as bait. I dipped our marshmallow in water to make it sticky. It worked some of the time, but we found adding peanut butter to our marshmallow did the trick (we tried honey too). I have seen people tie gummy worms to the end, and those work really good. We just didn’t have any at the time. 3. Place Goldfish crackers on the plate and let kids fish by holding their fishing poles above the plate, and dropping the bait on top of the fish to catch it. Put the fish on the counting mat in order. When all the fish are caught from the pond, remove them from the counting mat while counting. Put the fish in a small container. When all the fish are caught from the pond, dump them out and count them together. My little guy had so much fun with this activity. He especially liked turning it into snack time. Explore a new way to paint and create fish shapes without a paintbrush. 1. Mix paint with a little bit of water to make it easier to move around the paper. You may want to poke a small hole in the straw to help alleviate the chance of kids sucking the paint into their mouths. I didn’t do this step and we didn’t have a problem, but it does sound like a great idea. 2. Add a blob of watered down paint onto the paper and let kids blow into the straw to move the paint around the paper. If you blow in one direction only, the paint blob seems to take on an abstract fish form. 3. Once the paint is dry, draw on the paper and make fish shapes. We put our painting inside a page protector so we didn’t draw directly on our painting. That way we could use a dry erase marker and draw and create fish over and over again. Follow A Little Pinch of Perfect’s board Learn With Kids Activities on Pinterest. Thanks for learning with us today! Please click here to sign up for our weekly newsletter FOLLOW US on Facebook, Pinterest, Twitter. Love the activities! Pinned it! Thanks for sharing! Great ideas for the letter F!